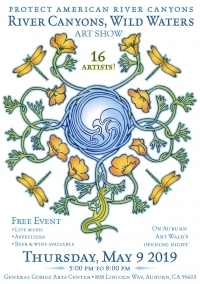 Protect American River Canyons (PARC) invites you to our River Canyons, Wild Waters Art Show at the General Gomez Arts & Event Center in Auburn on Thursday, May 9th from 5:00pm to 8:00 pm. 16 Artists will be featured, live music, libations, and appetizers will be offered. FREE Event! Call 530-537-2241 for more information.